It’s back to school time which means it’s back to school shopping time for parents and students. With the rough economic times families and students are looking for ways to save on back to school shopping, well here are 8 tips to help you with saving money on back to school shopping. There is a very good likelihood that you still have supplies remaining from previous year, especially if you have more than one child in school. So make sure you first check your inventory to see what you already have. After you have determined what is in your current inventory, make a list of what you need. Be specific! Because if you are not you will buy things that are not really needed. Try to have the list as detailed as possible to avoid purchasing unnecessary items. Stick to your list! Your kids will try to convince you that they have to have a certain item when they see it, if you already have the final list and the item is not on it you can easily explain to your kids that it is not really needed. Even better make the list with your child, that way they will be involved in the whole process and can not “forget” things. Set a fixed budget on how much you will be spending on back to school items and make sure your child is aware of this. As you put things in the cart repeatedly let your kid(s) know how much of the budget is left. Often parents throw away fliers they receive at home and miss out on some great coupons and sales, so keep those fliers! You can make it more fun by letting the kids cut out the coupons they need, this will save you not only money but also time (and teaches your kids an important lesson). Continue back to school shopping throughout the year, often we miss some great bargains throughout the year because we do not think of school shopping. Keep an eye out for sale items and bargains in the “off-season” and when you find something buy it and put it away for next year. Do not forget discount stores like Wal-Mart and even Dollar Store, you can save on many back to school items such as notebooks, pencils etc. Don’t buy from the first store you walk in, take some time and shop around and compare prices you’d be surprised how much you can save overall. Buy used books- Your School probably has a used book website, you can also check out Red Flag Deals used book sales forum. See if your friends are taking the class or have taken it so that you may use their books. Get in the habit of making your lunch and taking breakfast. The Lattee factor as David Bach would call it. Look for student fares/passes for transportation. Buy your supplies at Wall-Mart and discount Retailers. Green Treehouse Panda is part of a HP’s Back to School Giveaway so be sure to enter! 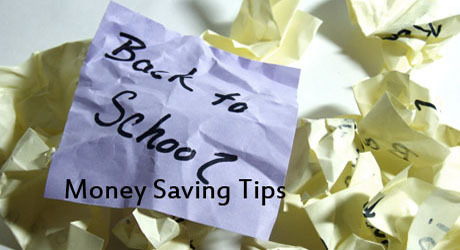 What are your back to school money saving tips? Have you used any of these tips? How do you try to stay within your budget? You’re right on about a list and sticking to what is needed. It’s real easy to see all the flashy new items on sale this time of the year and get a little crazy buying stuff, telling yourself you need it. Great tips. These tips will not only help you save money by having a budget but also by making purchases throughout the year and checking your home inventory can save you time and one less trip to the store. I had a strategy this year I wanted to test before publishing next year. And it’s working. These are both stores I pass nearly every day, no special visits required. Here’s what I would recommend ( I just did it for my boys )…get them prepaid cell phones and cancel their contract plans. I did alot of research and shopped around and finally settled for TracFone wireless. They have great ratings. Their new plan called “Straight Talk” (45 dollars for unlimited minutes and texts) was rated number 1 for coverage by Consumer Reports and J.D.Powers. Or you can just purchase their prepaid minutes, which is much cheaper. It has definitely saved me plenty of money!